Wilfred was born in Burton Latimer, Northhamptonshire, England. In 1928, he immigrated to Canada with his wife and son Morris; they settled in the Buffalo Lakes district. The couple had a daughter Betty after arriving in Canada. Wilfred died in September of 1971 in Grande Prairie at the age of 76. Martin was born in Halifax, Nova Scotia on September 21, 1879. He came to Edmonton in 1908 with his wife, Laleah Almon. He was Crown Prosecutor when the first court was sent to the Peace River country in 1910. Martin enlisted in the Canadian army in 1916; he made it only as far as England and was discharged on July 17, 1917. When he returned to Canada, he and his wife moved to Grande Prairie. He practiced law until 1942; later he served as a postmaster. Martin died of a heart attack on October 28, 1948 and was buried in the Grande Prairie cemetery. Thomas was born in East Garafraxa, Dufferin County, Ontario on September 26, 1869. When he enlisted in July of 1915, he was a widower with eight children between the ages of 4 and 21 (one of his sons, Lloyd, enlisted as well). Thomas was considered medically unfit due to rheumatism, and was discharged on February 4, 1916, before he ever left Canada. In May 1917 he joined up a second time, and once again, he was discharged was because of myalgia and rheumatism (April 1918). This time Thomas made it to England and served with the forestry corps. Sometime after this second discharge, he married a woman named Leona. Thomas died on March 11, 1933 and was buried in the Grande Prairie cemetery. Lloyd was born on September 6, 1896 in Cumberland County, Ontario. He enlisted in the Canadian army on June 15, 1915, just a couple weeks before his father Thomas joined up. Lloyd arrived in France a year later, in June of 1916. He had only been at the front a couple of months when he received a shrapnel wound to his right thumb at Courcelette (September 1916). The thumb had to be amputated at the No. 2 Australian General Hospital, and Lloyd was discharged in November of 1916. He died in March of 1970 in Edmonton. Dorothy Thomas was born on September 19, 1901 in London, England. She was working in the Red Cross in England when she met James Eastman. The couple was married in London at St. Barnabas Church Southfields in March of 1919. They sailed for Canada, and in 1923 settled in Halcourt (34-70-11-W6). They had seven children. Margaret died on July 7, 1990 at the age of 88. James was born in Grenfell, Saskatchewan in March of 1899. He later moved to the Edmonton area with his parents. In order to enlist in the Canadian army in 1914, James lied about his age, stating that he had been born in 1896. In September of 1915 James was put in confinement to await trial for having left his post before being relieved. He was sentenced to six months of hard labor, but this order was revoked in October. James then went absent without leave while on duty and was fined ten dollars. In November he forfeited twenty days' pay for neglect of duty, and in April of 1916 seven days' pay for being absent from roll call. James was engaged in the battle of the Somme, the Second Battle of Ypres, Passchendaele, Mons, and Vimy Ridge, and was awarded the Military Medal for conspicuous bravery. In March of 1919, James married Dorothy Thomas, a Red Cross worker, in London. The couple sailed for Canada, and in 1923 settled in Halcourt (34-70-11-W6). They had seven children. 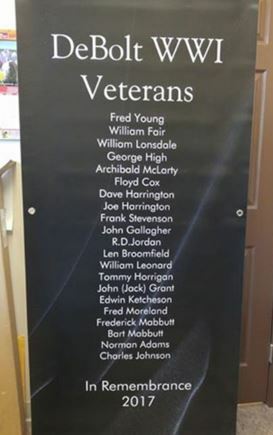 James also served in the Second World War, as a sergeant of the Detention Barracks. He died in Halcourt on October, 4, 1964. Nathan was born on March 27, 1894 in Calgary, Alberta. In 1916 he filed on a homestead at SW 32-71-10-W6. Nathan enlisted in the Canadian army in October 1916 under the name George Davis; the reason for his deception is unknown. In August 1917, he gave the army his real name. Months earlier, in February of 1917, Nathan had changed his will to leave everything to a Mrs. May Thomas, the widow of Harold Thomas. 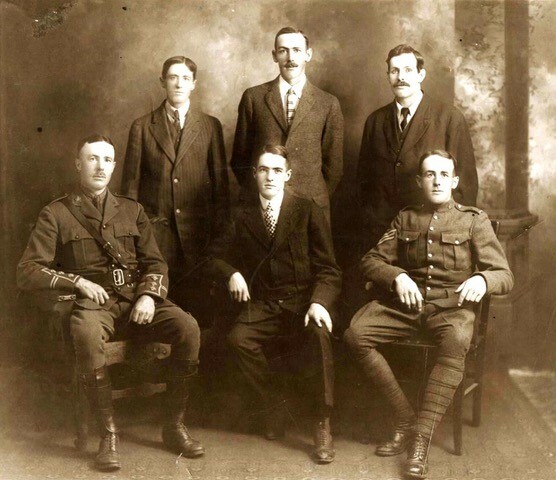 His brothers George and James also served in World War I. In January of 1918, Nathan married an Englishwoman named Jill. Nathan received gunshot wounds to his right hand in September of 1918. Walter was born in Cleveland, Ohio on September 7, 1880. He filed on a homestead at NW 36-71-8-W6 and also worked for the Hudson's Bay Company in Lake Saskatoon. Walter married Julia around 1906, and the couple had three children. He enlisted in the Canadian army in September of 1915 and was sent overseas. Late in 1916 there were mistaken reports that Walter had been killed in action, but a letter he sent to the Grande Prairie Herald in January 1917 confirmed that he was "very much alive and in good health." In August of 1917, he was awarded the Military Medal for bravery in the field. Walter was killed in action in the vicinity of Passchendaele on October 30, 1917. Arnold was born in Delhi, Ontario on March 5, 1890. He was living in Grande Prairie at the time of his enlistment in March of 1916, working as a blacksmith. It is very likely that blacksmith "Ernie" Ebert mentioned in the March 1916 Grande Prairie Herald was in fact referring to Arnold (Arnie). Arnold was wounded twice: first, a gunshot wound to his right leg in June of 1917; and later a gunshot wound to his right arm in August of 1918 at Arras. Carl was born in Nelson County, North Dakota on May 17, 1900 (he lied about his age on his attestation paper in 1918 and wrote 1899. He never made it overseas during World War I, and enlisted again during World War II, this time as Charles Eugene. Carl married Janet McMillan. At some point the couple moved to the South Peace and filed on a homestead at 4-73-26-W5. Carl died on February 7, 1965 and was buried in the Grande Prairie cemetery. Elmer was born in Hoisington, Kansas on April 7, 1888. He was living in the South Peace at the time of his enlistment in September of 1914. Elmer's homestead was at SE6-71-7-W6. In April of 1916, Elmer received shrapnel wounds to the base of his neck and right shoulder at Rollencourt, France. Pieces of metal were left deep in his neck (view x-rays on pages 83, 95, and 97 of his service file) because they caused no symptoms at first; later he complained of dull pains in neck and shoulder. He also had impaired vision in right eye after this. A shell explosion wounded Elmer's left leg in December of 1917 at Cambrai. He was discharged on August 12, 1918, having been deemed medically unfit, due to his leg wound. Elmer was very hard of hearing in his left ear, which had started before the war, but was aggravated during service. He brought his war bride, Winnifred, back to his homestead, where they lived until 1923. At this time, the family moved to Everett, Washington. Elmer and Winnifred had six children. Bertram was born in Ealing, England on May 8, 1881. He filed on homesteads at 34-71-10-W6 and SE 27-71-10-W6 on June 8, 1911, one of the first settlers in the Appleton district, and his was the first house west of the Beaverlodge River. Bertram enlisted in the Canadian army in July of 1916. From September of that year onward, he suffered from repeated attacks of inflammation on his feet, which was supposed to have been caused by contact with poison ivy. Bertram was invalided to Canada in December of 1917, and discharged in March of 1918. His sister Alberta joined him a few years after his return. Bert died in March of 1945 after a lengthy illness. "On August 15, 1917, on Hill 70, this N.C.O. was in charge of a carrying party supplying the front line with S.A.A., bombs and water. While on this work the party were observed by an enemy airman and immediately afterward came under a heavy artillery file. By personal courage and good leadership, this N.C.O. took his party forward and delivered his load to the 7th Cdn. Inf. Battalion, which was greatly in need of same. He made a second trip although the party suffered several casualties, and again delivered his load." After the war Andrew filed on a homestead at 28-75-2-W6. He left the area in the late 1930s, and died on August 26, 1956. Please note that the service file on LAC includes the papers of another soldier. Charles was born in Butte, Montana on June 8, 1897. At the time of his enlistment in July of 1915, he was living in the Peace River country. In October of 1916, Charles received shrapnel wounds to his head, left shoulder, and left thigh. He was invalided back to Canada in June of 1917 and discharged from the army in April of 1918 as he was medically unfit. Charles died on April 4, 1959. Edgar was born in Essa, Ontario on September 6, 1893, though he spent his early life in Lockwood, Saskatchewan. In 1911, he and his brother Ewart came to the Peace country and filed on land two miles west of what would eventually become the community of Clairmont (SE21-72-6-W6). Edgar enlisted in the Canadian army in October of 1915. He received shrapnel wounds to his left eye in October of 1916, and to his left arm and elbow in September of 1918 at Cambrai. In March of 1919, Edgar was invalided back to Canada. He married Gladys Rath of Clairmont in 1920; the couple relocated to the Rio Grande district and in 1935 moved to Victoria, BC. They had two sons. Edgar died in March of 1939 following an operation for ulcers on his stomach. Fred was born in Ottawa, Ontario on November 15, 1893. He filed on a homestead at 31-70-8-W6. Fred enlisted in the Canadian army in July of 1915 but was discharged in November of 1917 for transfer into the Royal Naval Air Service, which eventually became the Royal Air Force. In 1921, she and three other nurses (Amy McNish, Rachel McLean, and Elizabeth McLean) came to the Peace country and filed on homesteads at 24-77-5-W6 and 12-79-26-W5. Helena abandoned the homestead in 1928 (according to her service file, her current address in 1925 was in New York). Helena died on March 15, 1959. James was born in Newcastle-on-Tyne, England on November 29, 1893. At the age of twelve he began working in the coal mines. When the war broke out, James joined the Northumberland Fusiliers. He was wounded in France near the end of the war and sent home. James immigrated to Canada in 1919 and settled in Carbon, Alberta where he continued to work as a coal miner. While living here, James met Annie Cox and the couple was married on April 9, 1923. In 1926, James filed on a homestead at SE16-70-10-W6. His wife and their children joined him the following spring. Because he lacked farming experience, James did not prove up and the family returned to Carbon in 1930. He was gassed in the mine and was unable to continue his work there, so the Elsenders moved back to the homestead in 1934. This time James was serious in his attempt to learn farming; he and Annie remained on the farm until 1951, at which time they moved to Grande Prairie. James died in Grande Prairie in September of 1983 at the age of 89. Charles was born in Kalispell, Montana on December 31, 1896. He filed on a homestead at 20-73-8-W6, though at the time of his enlistment in March of 1916, he listed his current address as Vanguard, Saskatchewan. He suffered from a contused jaw on August 28, 1917. On October 30, 1917 Charles was reported missing in action. On December 15 of the same year, it was reported that Charles had been killed in action on October 30 in the vicinity of Passchendaele, while taking part in an attack on the German line. Donald was born in Norfolk, England on January 12, 1892. He immigrated to Canada with his family when he was very young. Donald enlisted in the Canadian army in January of 1915. He returned to Canada after the war, and married Mary Forbes Wright in 1922. In 1927, Donald filed on a homestead near Eaglesham. The family live don the farm until 1941, when they moved to Edmonton. In 1946, Donald and Mary moved back to the homestead for their retirement. Don died in July of 1955. Frank was born on January 9, 1880 in Edinburgh, Scotland. When the war began, he was living in the Lake Saskatoon area. Frank enlisted in the Canadian army in July of 1915, but deserted in February 1916, before he even made it overseas. Richard was born in Scotland and settled in the Flying Shot Lake area in 1926. James was born Millbridge, Yorkshire, England on May 29, 1876. He was living in Milton, Ontario at the time of his enlistment in December of 1915. He and his wife, Sybil Gertrude, had a daughter Sybil Mario, who was 10 in February of 1917. James served in England until being sent back to Canada in March of 1918. He was discharged on May 21, 1918, having been found physically unfit, at least partially due to bronchitis. In August of 1918, the family came to the South Peace where James filed on SE 30-78-20-W5 and NE 19-78-26-W5. James died in Vancouver on August 14, 1968. Cecil was born in Ottawa, Ontario on June 28, 1894. He came to the Peace Country with his stepfather in 1910, and two years later in 1912, at the age of 18, filed on his own homestead at SW20-71-2-W6. Cecil also began working as Bezanson's first official postmaster in 1914. He enlisted in July of 1915, and departed for France on June 29, 1916. On September 22, 1916, Cecil was declared missing in action, and on July 6, 1917, for official purposes, presumed to have died. However, his comrade Jimmie Scott confirmed that he had in fact been killed in action on September 15, 1916; he had not been with Cecil at the time but had spoken with two of the men who had found Cecil's body and buried him. One of those men was Frederick Robert Smith, who wrote to his wife that Cecil had died like a hero. He was killed in the advance from Pozieres to Courcelette during the Somme Offensive. Francis filed on a homestead in the Bridgeview district, at E 1/2-18-77-6-W6. A few years after he came here, he married Naomi Cook. The couple had five children. Robert was born in Norfolk, England on April 8, 1890. He enlisted in the Canadian army in June of 1915. On November 18, 1916, Robert received a shrapnel wound to his left shoulder. He was captured that day and declared missing in action on November 19. In February of 1917, he was unofficially listed as a Prisoner of War, having been captured at the Somme. He was held in German prison camps at Wahn, then Aachen (in March 1917), Stendal (March - May 1917), Julich (May 1917), and Wittenberg. Robert was finally released in January of 1919. After the war he homesteaded on SE28-76-5-W6, east of Woking. Robert also worked as a forest ranger until 1939. He died on December 30, 1974 at the Shaughnessy Hospital in Vancouver. James was born on August 18, 1892 in Manitoba. When he was drafted in May of 1918, he listed his present address as being Lake Saskatoon. The war ended before James made it overseas. He filed on a homestead at 31-53-16-W5. Reginald was born in Northwich, England on August 5, 1883. He enlisted at Shorncliffe in February of 1916. Reginald received shrapnel wounds to his left hip in July of 1916. Around 1919, he married Marie in England. Reginald and Marie came to the Chinook Valley area with their four daughters in 1929 and filed on a homestead at 28-76-6-W6. In 1931, Reginald lost an eye while working on the bridge across the Burnt River. Reginald and Marie moved into Grande Prairie around 1954 or 1955. 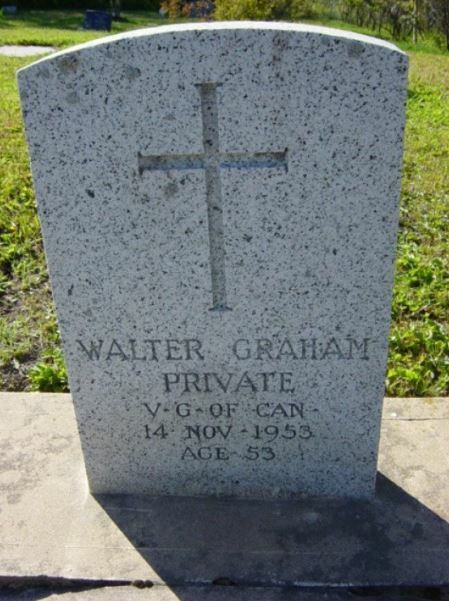 He died on September 2, 1965 and was buried in the Grande Prairie cemetery. William was born in Petersboro, Ontario on September 1, 1883. He enlisted in the Canadian army in September of 1915. On June 9, 1917 William was gassed, and only a short time later, on June 28, he received a gunshot wound to his right shoulder at Vimy Ridge. In October there was still a fairly large irregularly-shaped piece of shrapnel under the scapular spine on the left side, which was removed in December. After the war, around 1920, William and his wife settled in the Sturgeon Heights area, at 21-69-24-W5. They lived there until 1942. William died on July 17, 1954. Forrest Clinton Falk was born August 23, 1895 in Sumner, Iowa. When he was six years old, he was placed in the Lutheran Orphans’ Home in Waverly, Iowa by his father, but was retrieved two months later by his relatives. By the time he was 15, he had rejoined his father and was working at any odd jobs he could find in Muskogee, Oklahoma. At the age of 17, Forrest traveled as a stowaway by train up to Edson, then drove a team over the Edson trail for Leonard Beard, a settler coming to Grande Prairie with his family. They arrived in September 1911. In 1912, he was joined by his father, John Frederick Falk. Father and son worked at proving up their homesteads over the next years, with Forrest working out as a ranch hand and a hauler on the trails. Forrest's homestead was located at 21-72-5-W6. On September 23, 1917, Forrest enlisted as a Private 1st Class for World War I at Deer Lodge, Montana. He fought at Cierges Fermes and Soissons in the Second Battle of the Marne in 1918, and was injured during this last raid at Juvigny, on August 30, 1918. He had received a wound to his left side, by a high explosive German 77mm shell. After 4½ months in an American Red Cross hospital in St. Aignon, France, he was released. In 1927, Mr. Falk married Edith Catherine Paige. Forrest died in Grande Prairie on December 12, 1980. George was born in Cullen, Banffshire, Scotland in 1896. He enlisted in the 2nd Battalion, Gordon Highlanders in March of 1915 and served in the army until 1919. George was gassed in France and suffered poor health for years as a result. He and his wife had eight children. George died on April 29, 1941 and was buried in the Lake Saskatoon Cemetery. Howard was born in Smith Falls, Ontario on March 16, 1887. He was living in Edmonton at the time of his enlistment in May of 1916. In October of 1918, Howard suffered from gunshot wounds to his left shoulder. After being discharged in 1919, Howard filed on SW 1-77-21-W5 and NW 2-77-21-W5. According to the present address card in his service file, Howard was living in Vermilion in 1922. Ivor was born in Merthyr Tydfil, Wales on March 15, 1889. He enlisted in the Canadian army in Canmore, Alberta in January of 1915. On March 22, 1917, Ivor sustained a gunshot wound to his head (skull fracture) and left shoulder. He suffered from severe headaches and nervousness as a result and was discharged in February of 1918. On July 2 of that year he filed on a homestead at 6-74-3-W6 in the Teepee Creek area. Ivor returned to England before World War II, and died on March 4, 1958. Henry was born in Grouard on July 19, 1899 (1900?). He was drafted in June of 1918. Henry filed on a homestead at 0-78-5-W6, and on March 24, 1933 he married Marion Christopherson at Christ Church in Grande Prairie. The couple raised eleven children. In 1942, Henry once again enlisted in the army, serving in the Veterans Guard in Lethbridge. The family moved by to the Rycroft area after the war. Henry died on October 17, 1980 in Spirit River. Samuel was born in Edmonton, Alberta on September 23, 1891. He filed on a homestead at 35-71-2-W6, though at the time of his enlistment in February of 1916 he listed his present address as Edmonton. His brother William also served during World War I. Samuel completed officer's training and transferred to the British army around the beginning of 1918. He died on September 8, 1918, possibly during the Second Battle of the Somme. William was born in Guysburough, Nova Scotia on October 31, 1887. He filed on a homestead at 7-72-2-W6, though at the time of his enlistment in September of 1915, he gave his current address as Edmonton. William's brother Samuel also served in the war and was killed in action. William was a medical student and in September of 1917 was sent back to Canada to resume his studies. William was born in Bellshill, Lanarkshire, Scotland on August 31, 1882. He came in over the Edson Trail in 1912 and on September 9 filed on NE3-73-5-W6 in the Morningview (Sexsmith) area. William enlisted in the Canadian army in July of 1915. He received a shrapnel wound to the back on July 1, 1916. After the war, on December 31, 1920, he filed on SE10-73-5-W6 as his Soldiers Settlement Board property. William married in 1922, and died on November 6, 1960 in Victoria, BC. George was born in Aberdeen, Scotland on September 29, 1893. He enlisted in Edmonton on July 23, 1915. George was wounded twice during his time in the Canadian army. In September 1916 at Courcelette, he received a gunshot wound to his wrist. Later, in September of 1917 at Vimy Ridge, he was wounded by a shell in his left arm and head and had 'small metallic foreign bodies' in each arm. George filed on a homestead at 30-78-5-W6 and died on October 8, 1967. Joseph was born in Charlottetown, PEI on November 30, 1892. At the time of his enlistment in July of 1916, he was living in Grande Prairie. However, his latest known address in 1922 was Charlottetown so he must have chosen to return to his hometown after the war. Clarence was born in Folly Village, Nova Scotia on June 21, 1884. He came to the Grande Prairie area over the Edson Trail in 1912 and filed on a homestead in the Hermit Lake district (4-72-7-W6). After proving up his homestead, Clarence went to visit his family in Medicine Hat and there enlisted in the Canadian army. He came down with pneumonia on the journey to England in October of 1916, was in hospital until February of 1917. After the war, Clarence went into a partnership with C.R. Bell and bought Robertson Hardware. He married Gladys Thomson in 1923; the couple had one daughter, Phyllis. Clarence died on May 12, 1948. Clarence was born in Claremont, Ontario on November 1, 1881. In 1907 he moved to Edmonton and served as a supervisor of physical instruction in local schools. His younger brothers filed on homesteads in the Beaverlodge area, and in 1909 Clarence filed on a homestead as well (31-71-9-W6). In 1910 he married Mercy Elizabeth (Libbie?) Grant. When Clarence joined the Canadian army in May of 1915, his wife went with him to serve in England as a nurse. However, she returned to Canada when Clarence was sent to the front lines in France. He was awarded the Military Cross while serving overseas. According to the Circumstances of Death Register, Clarence was hit in the stomach by an enemy machine gun bullet and killed instantly during an advance in the vicinity of Cambrai on September 29, 1918 .
p. 21: Company Commanders of both the "A" and "B" Companies were killed in action at 8:00 AM. Mercy married Clarence Flint in 1910. When Clarence joined the Canadian army in May of 1915, she went with him to serve in England as a nurse. However, she returned to Canada when he was sent to the front lines in France. Clarence was killed in action in 1918. In 1929, Mercy married Arnold Christie of Grande Prairie. She died in 1960. Arsene was born in Belgium on April 19, 1900 (he gave 1897 as his date of birth on his attestation paper, as he was underage when he enlisted). He came to Cochrane, Alberta as a child with his parents and three siblings. Arsene enlisted in Calgary in January of 1916, not yet sixteen years old. In October of that year he was seriously ill with pneumonia, but he recovered and returned to Canada in 1919. In spring of that year, he came to Grande Prairie and filed on homesteads at 2-72-5-W6 and 7-72-26-W5. Arsene married Ellen Andress. They eventually moved to Detroit and worked for the Chrysler Company. Arsene died on September 4, 1968. James Archibald Foote was born in Perth, Ontario to David and Catherine Foote. His service files show some conflict regarding his date of birth, with his initial Attestation Paper stating July 23, 1880 and subsequent documents stating July 20, 1887. In August of 1914, at the onset of the First World War, James enlisted in the Princess Patricia’s Canadian Light Infantry and shipped overseas to serve on the Western Front. The Princess Patricia’s fought at the Second Battle of Ypres, which lasted from April 22 until May 25, 1915. It was the first mass use of German poison gas, and also the battle during which Lt. John McCrae penned “In Flanders Fields.” In the days preceding the battle, James was digging communication trenches at Polygon Wood, near Ypres. On April 11, he “got a rifle bullet through left thigh, about 8 inches above the knee.” He spent eleven weeks in hospitals in France and England, but the wound had been a severe one and after leaving the hospital James still walked with a limp and experienced pain in his leg. He was discharged from the army and returned to Canada in January of 1916. But James by no means left army life behind him. He was influential in recruiting for the 257th Railway Construction & Forestry Battalion; his forceful public speaking skills made him successful at securing men. On January 1, 1917 he reenlisted in the 256th Railway Construction Battalion. This time he left behind a wife; on March 22, 1917, four days before his departure, James married Nellie Alice Mason in Toronto. When he returned from overseas in 1919, James and Nellie moved to Sexsmith. James passed away in Edmonton on August 14, 1949 and was buried in the Soldiers’ Plot at Beechmount Cemetery. Ernest was born in Ingelow, Manitoba on August 1, 1891. He came to the Peace River country in 1916 with his brother Will and a close friend, Charlie Ames. They arrived on June 18, 1916. All three men filed on land in the Bezanson area; Ernie's land was located at 22-72-3-W6 and 15-72-3-W6. Ernie was drafted in January of 1918. On October 1, near the Berlonge Woods at Cambrai, France, he sustained a gunshot wound to his left leg. Ernie spent what remained of the war in England and was discharged on February 28, 1919 and returned to the Peace Country in March. During the winter of 1919-1920, he and the Ames brothers set up a sawmill at Moodie Crossing. On December 1, 1924, Ernie married Hazel Tealinda Shedin. The couple had three children. In 1938, Ernie and Hazel moved from their farm in Bezanson into Grande Prairie. They operated Ford's Grocery Store on Richmond Avenue until their retired in 1965. Ernie died suddenly on August 29, 1975 after suffering a heart attack. Joseph was born in Green Valley, Quebec on December 7, 1887. An adventurous young man, he worked all across Canada, whether it was logging in Ontario or ranching in Alberta. Joseph enlisted in the Canadian army right at the beginning of the war, on September 23, 1914 and was fortunate to enjoy a fairly uneventful military career. In 1919, Joseph married Christina Spier, a Scotswoman from Ayr. After Joseph was discharged in September of that year, the couple returned to Canada and journeyed west to Grande Prairie. They filed on a homestead at 9-71-5-W6 in the Five Mile Creek district. Joseph died in January of 1976 at the age of 90. William was born in Hartlepool, England on July 10, 1895. He filed on a homestead in the Spirit River area (33-77-2-W6). William was drafted towards the end of the war, and arrested as a defaulter on July 29, 1918. Elmer was born in Plymouth, Indiana on October 7, 1881. He was living in Nelson, BC at the time of his enlistment in December of 1915. He received severe gunshot wounds to his left arm and cheek on June 7, 1917 at Lens. On December 17 of that year, Elmer married Mary Ellen (see page 37 of his service file). He was invalided to Canada that month and discharged on March 7, 1918. Later that year, he filed on land at NE 23-71-11-W6, SW 10-77-3-W6, and NE 22-71-11-W6. Elmer died on May 8, 1954. Louis was born on December 27, 1896 in Frampton, Quebec. He came to Donnelly, Alberta in 1916 and filed on 18-78-20-W5. Louis was drafted in the summer of 1918 and although he shipped out to England, he never served at the front lines in France. On February 28, 1925 he married Georgina Nadeau. The couple had six children. Louis died in Edmonton on February 7, 1935 after a short illness. Charles was born in West Hoathly, Sussex, England on February 18, 1886. At the time of his conscription in early 1918, he was living in Grande Prairie. Charles had filed on land at 20-72-11-W6 and 32-72-11-W6. He arrived in France in October of 1918, when the war was nearly over, and was there until January of 1919. Robert was born in Windsor Mills, Quebec on December 20, 1891. He worked his way west and eventually filed on 20-70-11-W6. Bob enlisted in January of 1915 and in April of that year was discharged 'by purchase' in Calgary. Three years later, in the summer of 1918, he was drafted. Bob arrived in England in October of 1918 and served with the 21st Reserve Battalion. He returned to Canada in 1919, at which time he sold his former homestead and settled instead on his Soldier's Grant at 15-70-11-W6, where he built his cabin. On October 11, 1932, Bob married Ethel Dixon; the couple had one son. Bob died on January 4, 1952. Sydney was born in Bath, England on June 2, 1889. He came to the Peace River country in November of 1914 with his brother Walter and filed on homesteads at 33-77-2-W6 and 4-78-2-W6. Sydney enlisted in the Canadian army in January of 1916; once again, he and Walter went together. He married Delima Fortier Bolduc, the widow of Dave Bolduc. She had three young daughters from her first marriage. Sydney died on March 7, 1955. Walter was born in Bath, England on August 10, 1894. He came to the Peace River country in November of 1914 with his brother Sydney and filed on homesteads at SW1/4-33-77-2-W6 and NW1/4-28-77-2-W6. Walter enlisted in the Canadian army in January of 1916; once again, he and Sydney went together. In January of 1918 he accidentally injured (perforated) his left foot. Walter was discharged on April 5, 1919. In 1925, he married Susan Smith, an Irishwoman who taught at various Peace Country schools. Walter and Susan had three children. In the winter of 1944/1945 Walter suffered from pneumonia, and so he and his wife moved to a milder climate in British Columbia in fall of 1945. Walter died on April 27, 1988 (uncertain; see page 27 of service file). Colin was born in Pembroke, Ontario on February 28, 1896. At the age 15, he came west and stayed with his brother in Edmonton. Colin worked with a survey crew for two summers. He married Elizabeth, whom he had met while working on the railroad to Gibbons, on April 20, 1918. A few weeks later Colin was drafted. He went overseas to England, where he remained for sixteen months. After the war, Colin and Elizabeth settled in the Teepee Creek area (21-74-3-W6). Colin died in late September/early October of 1964. George was born on April 13, 1898 in Eaglesham, East Renfrewshire, Scotland. He lied about his age in order to enlist in the Argyll & Sutherland Highlanders when World War I broke out (he was only 17). He was transferred to the Machine Gun Corps headquarters in Grantham, Lincolnshire, England, where he was stationed for five months before being sent to France. George was in the Battle of Bullen Wood in November of 1917. On March 21, 1918, George was captured and taken prisoner. He was released on November 11, 1918 when the Armistice was signed. After the war ended, George had a month's leave then reenlisted to go to Russia for two years, to fight in the Bolshevik War. It was 1921 when he finally returned to Canada. After working in southern Alberta for some years, George came up to the Peace Country in November of 1932 and settled in the Sexsmith area. On February 16, 1942, he married Agnes Purves. George died on November 23, 1979 and is buried in the Emerson Trail Cemetery. Hector was born on Cape Breton Island, Nova Scotia on August 28, 1882. Around 1920, he filed on a homestead at 15-70-22-W5. Isaac was born in Londonderry, Nova Scotia on August 1, 1892. He worked as a linesman for the Canadian Pacific Railroad and enlisted in the Canadian army in April of 1915. In November of that year, Isaac suffered from an ingrown toenail which led to severe septic foot. He was not discharged from the hospital until three months later, in February 1916. In May, Isaac received shrapnel wounds to his legs, back, and elbow. As a result, his left hand was partially paralyzed when he was discharged from the hospital. Isaac was also charged with losing by neglect one gas mask and satchel in the field May 14 1916. On December 16, 1916 Isaac was granted permission to marry Daisy Charlotte Hollier. After the war, the couple homesteaded at 6-79-4-W6 in the Spirit River area. He later moved to Windsor, Ontario where he worked for the Ford Motor Company, and about 1930 he moved to Brookside, Nova Scotia. With the outbreak of the Second World War, Isaac again enlisted and served overseas until the end of the war. His son John Albert Frazee was killed in action at the age of 19 on October 27, 1944 at The Schelt, Holland. Isaac died on June 12, 1950. Edith Louise Hibbs was born on November 14, 1889 in Montreal and was a nurse living in London when she signed up for military service in September of 1915. Her attestation paper describes her as having fair hair and blue eyes. Edith served with the Canadian Army Medical Corps and was soon sent to Malta, where the conditions coupled with the climate took a toll on soldiers and medical staff alike. Edith was no exception. She contracted malaria in November of 1916 and is noted as being sick with it at least four more times. Edith also saw service in Turkey and the Dardanelles. She was discharged from service after her last bout with it in 1917. Edith was then invalided back to England where she continued to work in the hospitals for the duration of the war. Edith was awarded the Royal Red Cross by King George V at Buckingham Palace on April 28, 1919 – an honour that was awarded in the United Kingdom and Commonwealth for exceptional services in military nursing. Edith came to the Peace Country upon a request made to her by Dr. Lewis J. O’Brien, whom she had met during her military service. Dr. O’Brien offered Edith the job of matron of the Katherine Prittie Hospital in Grande Prairie. Edith agreed and left her job at Summerland, B.C. Conditions were primitive at the log pioneer hospital that had no running water or power and a telephone that shut off at midnight. In 1929 a new hospital was built with a larger capacity, improved facilities, and modern equipment. Edith continued in her old position becoming the first matron of the new hospital. In 1929, Edith married the local veterinarian Dr. Louis Fredette and gave up her position as matron. They had a daughter, Hope. Louis died in 1960 and Edith in 1964. Ed was born in Menomonie, Wisconsin on March 4, 1896. He was quite young when he came to Canada and eventually settled in Claresholm, Alberta. Ed was drafted into the Canadian army in May of 1918 and the war ended before he left Canada. In 1930, he and his wife Ruby settled in Hythe. Ed died in January or February 1964. Frederick was born in Clinton, Ontario on January 6, 1895 (1885?). He enlisted in the Canadian army on January 7, 1915. After the war, Fred and his older brother came west to work for the government as fire rangers. In 1939 he gave up this position and returned to the east. The following year he married Rose. Fred and Rose returned to Summer Crossing, near the Little Smoky. The couple had three daughters. Frederick was born in England in 1885. He came to Canada in 1910 and journeyed over the old Athabasca Trail, eventually settling on the SE 28-72-8-W6 in the Lake Saskatoon district. At the beginning of World War I, Fred walked to Edmonton to enlist. In May of 1917, he was discharged on appointment to a commission; Fred was appointed Second Lieutenant in the Royal Sussex Regiment. He served in France and Flanders and was wounded three times in the course of the war. In 1918, Fred married Winifred Fishbourne, a VAD nurse. They returned to Canada in 1919 and resumed farming. Fred was instrumental in planning and building St. Andrew's Anglican Church at Lake Saskatoon. In 1948, the Frewers retired to Vancouver. Fred died on November 13, 1966. Winifred was born in England around 1892. She served as a VAD Nurse from June 1, 1915 until July 2, 1918, working at Queen Mary's Military Hospital in Whalley, Lancashire and on board the Aquitania. Winnie married Fred Frewer in 1918, and they came to Canada together in 1919, returning to the land Fred had filed on in 1910. In 1948, the Frewers retired to Vancouver. Winnie died in January of 1968. Leonard was born in Hull, Yorkshire, England on October 13, 1892. In 1911 he came to Canada and lived in Saskatchewan for six years. Leonard walked to Grande Prairie in 1917 and filed on a homestead at 33-72-11-W6, in the Beaverlodge area. He worked in the lumber camp and in Billy Salmond's hotel until he was drafted that winter (January 1918). He was placed in the Medical Office. In 1923 Leonard went to England and married Clara Larrard. They spent their honeymoon crossing the Atlantic and returned to Leonard's homestead near Beaverlodge. Clara died on October 21, 1971 in the Beaverlodge hospital. Arthur was born in Epsom, England on February 12, 1890. He came to the Peace Country in 1912 with his brothers Thomas and Herbert, and filed on homesteads at 12-71-11-W6 and 1-71-11-W6. Arthur enlisted in the Canadian army in March of 1915. He wrote a series of letters to the Grande Prairie Herald about his journey to England, life in the training camp, and experiences at the front. In August of 1918 Arthur was wounded, and in March of 1919 he was awarded Meritorious Service Medal. He was deemed medically unfit because of varicose veins and myalgia and discharged in June of 1919. Arthur died in December 1974/January 1975 in Beaverlodge. Herbert was born in Epsom, England on March 12, 1889. He came to the Peace Country in 1912 with his brothers Thomas and Arthur, and filed on homesteads at 13-69-11-W6 and 12-71-11-W6. Herbert enlisted in the Canadian army in September of 1915. He went missing between September 15 and October 4 of 1916, and rejoined his unit on October 15. On June 9, 1917 Herbert sprained his ankle, received shrapnel wounds to his face, and possible suffered from a concussion as well. He attended the School of Cookery in June 1917. Herbert was discharged in February of 1919, having been deemed medically unfit due to varicose veins. He died on February 9, 1954. Felon was born in Cernipol, Kiev, Russia (now Ukraine) on July 25, 1891. He was farming in Spirit River (14-78-5-W6) at the time of his enlistment in September of 1916. Jack was born in Loon Creek Saskatchewan on March 5, 1895. At the time of his enlistment in October of 1915, he was living in Beaverlodge (31-76-9-W6). James was born in Dromahair, Ireland on April 20, 1891. He came to the Peace Country in 1919 and filed on homesteads at 25-72-12-W6 & 26-72-12-W6. In 1937, James married Lydia Pretzer. The couple had two children, Joyce and Douglas. James died in the Misericordia Hospital in Edmonton on December 20, 1961. John was born in Largs, Ayrshire, Scotland on November 28, 1877. He came to Canada before the war and lived in the Hamilton area, where he enlisted in July of 1915. In the early 1920s, John came to the Peace country and filed on a homestead at 2-72-1-W6, near DeBolt. On August 30, 1932, John married Jane Seville. John died in Edmonton in April of 1964. Alfred was born in Quebec City on February 15, 1884. At the time of his enlistment in September of 1915, he was living in the Grande Prairie area (19-71-5-W6). Alfred was wounded in June of 1918, having received shrapnel wounds to his thighs, arms, and face. He was discharged in December of that year. Alfred returned to his home province; as of 1939, his address was in St. Fabien de Panet, Quebec. He died on September 10, 1952. Billy was born Tysoe, Warwickshire, England on July 12, 1887. He emigrated to Canada in 1911 and took up a homestead in the Lake Saskatoon area. When war broke out, Billy enlisted and went overseas. He met and married Violet Eveline Oldham in 1917 and when Billy was discharged in 1919, he brought his wife and their young daughter Zoie back to his homestead in the South Peace. They returned to England in 1927, but after two years moved back to Canada. Billy and Violet had ten children. They retired to Victoria in 1952, and Billy died on December 26, 1956. Joseph was born in St. John, New Brunswick on November 28, 1878. In 1912, he and his wife Minnie filed on a homestead at SE 35-77-21-W5. Joseph enlisted in the Canadian Army on May 3, 1916, listing "weaver" as his occupation. On September 2, 1918, Joseph was killed in action near Dury. An enemy shell exploded near him, and a splinter entered his head, killing him instantly. Minnie filed on another homestead near Falher, and later was remarried to Charles Christopher Roche. Robert was born in Bristol Township, Quebec on June 13, 1870. He enlisted in April of 1916, and after being discharged in 1919 came west and filed on a homestead at SW 13-74-7-W6. Robert's son, Robert John Gerow, also served in the Canadian army during World War I.
Robert was born in Crystal Mines, Quebec on November 16, 1895. He enlisted in the Canadian army in January of 1916. His father later followed suit. Robert was given permission to marry Jane A. in 1919, and later that year the couple came to the Buffalo Lakes area, where Robert filed on a homestead at NE 13-74-7-W6. Robert died in April of 1970. Robert was born in Acrise, Kent, England on March 9, 1891. He filed on a homestead at 33-74-8-W6 in 1914. Robert enlisted in the Canadian army shortly afterward and served as a sniper until he sustained a serious injury. In April of 1916, at Hill 60, a shell exploded in front of him and he suffered from shrapnel wounds in his shoulder and left eye. Robert lost sight in that eye and spent the rest of the war in England. After being discharged, he returned to the South Peace. Robert died in 1931. Thomas was born in Manchester, England June 28, 1893. He enlisted in Toronto in August 1916 and was discharged in October 1918, having been deemed medically unfit due to tuberculosis. After the war Thomas came to the Peace country and filed on a homestead at 12-78-1-W6. Joseph was born in Boston, Massachusetts around 1882. He served in the US Merchant Marine Service in England and France during World War I, from January 11, 1912 until February 7, 1919. After the war, Joseph and his wife Daisy came to the South Peace and filed on a homestead at NE 9-70-22-W5. Joseph died in 1960 at the age of 78. Riley was born in Tekamah, Nebraska on November 17, 1891. At the time of his enlistment in July of 1915, he was living in the Grande Prairie area and had a homestead at 17-73-8-W6. Less than a month after he arrived in France, Riley received gunshot wounds to his left leg and right arm on June 30, 1916 at Ypres. The day before he had also been diagnosed with shell shock. Riley was invalided to Canada for further medical treatment in June of 1917 and spent one year and eight months in the Strathcona Military Hospital. On October 10, 1918 Riley was in a car accident and fractured his left femur. The injury left his left leg 2 1/8 inches shorter than the right, and the circumference of his left calf was 3 inches less than the right. Riley was discharged from the army in May of 1919, and died on January 1, 1955. William was born in Englee, Newfoundland in April of 1880. He was awarded the Military Medal in October of 1916. William suffered from neurasthenia in 1911 as a result of the strain of service and infection. On September 29, 1918 at Cambrai he received gunshot wounds to the chest. After the war, William married Edna Rennie, the widow of his friend Gordon who had died in the war, in Toronto. They brought their family to the Beaverlodge area in the 1930s. William died on December 3, 1965. Hugh was born in Aberfoyle, Perthshire, Scotland on July 8, 1890. He immigrated to Canada in 1909 and in the spring of 1915 he filed on a homestead at NE 25-73-5-W6. In September of 1916 at the Somme, Hugh received a gunshot wound to his left arm. According to a medical report dated March 1918, he was slightly nervous as well. Hugh married May Galbreath on December 11, 1918; the couple had met while Hugh was in hospital. May had also served in the war. The couple set sail for Canada in February 1919. Hugh and May had three children. May died of leukemia in April of 1923, just months after the birth of their third daughter. In 1941 Hugh married Kathleen Jantz; they had three children. He died on September 17, 1963 and was buried in the Emerson Trail Cemetery. Malcolm served at Gallipoli with the Imperial Army, and later served in France as well. He came to the Sexsmith area in spring of 1920, but left for Calgary that fall. On December 31, 1921 Malcolm married Annie Foster; they returned to Sexsmith in 1927, filed on a homestead at 5-74-3-W6, and ran Gillies' Groceteria. In 1933 they moved to Kimberley, British Columbia. Malcolm died in Victoria in 1967. Mary "May" was born in Greenock, Scotland. She served as an ambulance driver in Macedonia during the war, from February to September of 1917. Before going overseas, May had met Hugh Gillies while he was in hospital in 1916. The couple were married in Greenock on December 11, 1918. Three months later, in February of 1919, they set sail for Canada. Hugh and May had three children. May died of leukemia in April of 1923, just months after the birth of their third daughter. Stanley was born in Kansas City on June 18, 1896. He came to Canada with his parents in 1901 and settled near Stettler, Alberta. In February 1916, Stanley enlisted in the Canadian army. He received shrapnel wounds to his legs and left hand in August of 1917 and was invalided to England. Stanley attended the School of Cookery in London in April of 1918. Twice he went AWOL - thirteen days in December of 1918, and again in May of 1919. He was arrested in London. Stanley married Sophie on October 30, 1923. The couple moved to the Valleyview area in 1936, but left in 1944 and moved to High Prairie. Stanley died on October 1, 1970. Cephas was born in London, Ontario on March 31, 1893. In 1912, he and his father came up to the Belloy area to homestead. Cephas enlisted in the Canadian Army at Valcartier on September 22, 1914. On March 17, 1917, Cephas married Irene, an English woman who was employed at a munitions factory. In 1919, they came to the South Peace. Cephas filed on the southern half of 10-78-2-W6, but his work with the railroad meant the family moved a great deal and he did not prove up on either quarter. Cephas died in June of 1982. Bill was born in Warren, Ontario on March 4, 1894. He came to the Grande Prairie area in 1911 and filed on a homestead at SW 22-71-8-W6. Bill enlisted in July of 1915 and served in Belgium and France. He received a gunshot wound to the leg in September of 1916, and had his appendix removed in February of 1918. Bill moved to Missouri after the war. Oliver was born in St. Levis, Quebec on January 12, 1872. He was one of the earliest settlers in the Spirit River area. Oliver enlisted in the Canadian army in August of 1916. Because he suffered from myalgia, he was sent back to Canada in the winter of 1918 and discharged in January of 1919. After being discharged, he returned to his homestead (14-78-5-W6 and 7-79-6-W6) in Spirit River. Oliver died on February 1, 1946. Oliva was born in Fall River, Massachusetts on April 15, 1898. He came to the South Peace with his parents at the age of 14. In 1916 Oliva was drafted into the Canadian army. He married Eva Roy on April 25, 1922. The couple lived in the Donnelly area (36-77-21-W5 and 12-77-21-W5). Oliva once again joined the army in World War II and served for six years. When he returned, Oliva and Eva moved to Grande Prairie. Oliva died on September 7, 1960. Sylva was born on August 29, 1895 in Fall River, Massachusetts. At the age of 18 he came to the Peace River country with his family and in 1914 filed on a homestead north of Falher (26-77-21-W5, 24-77-21-W5, and 34-78-21-W5). Sylva was drafted into the Canadian army in June of 1918. On April 15, 1919 he married Marie Louise Brulotte. In 1921, they moved to Washington state, though they returned with their three young children in 1928. Sylva opened the first general store and post office in Girouxville. On December 8, 1941, Sylva was trapped in his burning store and died in the fire. He was buried in the Falher cemetery. William was born in Dunkineely, Ireland on March 14, 1883. He immigrated to Canada in 1911 and headed west to Calgary. William enlisted in the Canadian army in 1914 and was sent overseas. On September 5, 1918, he was awarded the military medal and received the following citation: "This NCO was in charge of the water details,. During the Amiens offensive on the 10th August when a watering point was under heavy shell fire he carried on back and forwards until his cart was filled. Later in the Arras offensive he worked day and night to keep the men in the line watered." William married Elizabeth Walker in November of 1918. They returned to Calgary after William was discharged in 1919. They moved to Grande Prairie with their young children in 1929. William died in Grande Prairie at the age of 94. James was born in Londonderry, Ireland on January 22, 1895. He joined the Canadian army in April of 1916, and was discharged as a deserter on October 27, 1916. James was later pardoned and it is likely he left the army to join the navy, where he served until the end of the war. His brother William served in the Canadian army as well. After being discharged in 1919, James settled in Spirit River. He married Etta Welch Hakes on December 10, 1930 in Killam, Alberta and the couple moved to Spirit River in 1935. James died in Grande Prairie on January 19, 1972 and was buried in the Spirit River cemetery. William was born in Londonderry, Ireland on August 9, 1893. He came to Canada in 1910 and settled in the Peace country in 1912. William was drafted in 1918; his brother James also fought in the Canadian army. He served in France and married his wife Sarah Heatherington, an Irishwoman, during the war. The couple returned to Canada after William's discharge. William died on August 20, 1965. Harry was born in what is now Bibrka, Ukraine on February 2, 1900 (at that time it was Austrian territory). He was drafted into the Austrian army in 1917; after serving for a year, he was captured and held as prisoner of war in Italy for eighteen months. Harry was released in spring of 1920 and returned home for a year. He later volunteered to serve in the Polish army for eighteen months, and was discharged in 1924. In November of that year, Harry married Julia Palawada. Harry immigrated to Canada in 1927 and his wife and two daughters joined him in 1929. They settled in the Saskatoon Mountain area, and moved into Grande Prairie in 1965. Harry died on July 28, 1996. "While with Battalion on Train and in passing from one coach to another he slipped off step and fell into lake and swam ashore. He was unable to find shelter and was exposed to frostbite. He was operated on at Haileybury Hospital and had both feet amputated at mid tarsal joint. He has been supplied with artificial apparatus which is satisfactory." Byron was born in Hudson, Wisconsin on October 21, 1897. He enlisted in August of 1918, but was discharged in October to reenlist in the Royal Naval Canadian Volunteer Reserve. On March 31, 1920, Byron married Berta. His homestead was located at 26-74-13-W6. Hank was born on December 12, 1876 in Quebec. He came to Grande Prairie in 1916, and enlisted in August of that year. However, Hank was discharged on December 21, 1916 because of flat feet. He and his wife Lizzie returned to the Grande Prairie area in 1921 with their six children. They moved to Vancouver in 1930. Hank died on January 13, 1952 while visiting his daughter. William was born in Rattray, Perthshire, Scotland on November 21, 1878 (1874?). In 1903 he immigrated to Canada and settled in Manitoba. Eight years later, in 1911, he continued on to Alberta. William joined the Canadian army in March of 1915. After his discharge, he settled in the Lake Saskatoon area where he lived until 1930, at which time he relocated to Hinton Trail. William never married and worked as a carpenter throughout his life. He died in the Beaverlodge Hospital on January 22, 1967 and was buried in the Grande Prairie cemetery. Fred was born in New Marske by the Sea, England on May 29, 1888. At the time of his enlistment in February of 1915, Fred was living in Alberta and had filed on a homestead at 34-72-8-W6. In October of 1915, he married Dorothy Ellen. Fred was injured several times during his military career. First he suffered from shell shock and a gunshot wound to his right knee in June of 1916 at Ypres; he was wounded again in April of 1917; in August of 1917 he was gassed as well as once again sustaining a shell wound; and on November 10, 1917 he was buried by a shell and severely wounded. Fred served briefly in Russia after the end of the war and was sent back to Canada in September of 1919. As of 1922, Fred's most recent known address was Willow River, BC. Charles was born in County Antrim, Ireland on December 31, 1884. At the time of his enlistment in July of 1915, he was living in the South Peace and had filed on homesteads at 18-71-6-W6, 17-78-6-W6, and 30-70-10-W6. Charles served in England during the war and while there, married his wife Mary on August 9, 1916. Anthony was born in Edinburgh, Scotland on February 9, 1885. He settled in the Clairmont area in 1910 and had homesteads at 7-72-5-W6 and 32-72-5-W6. 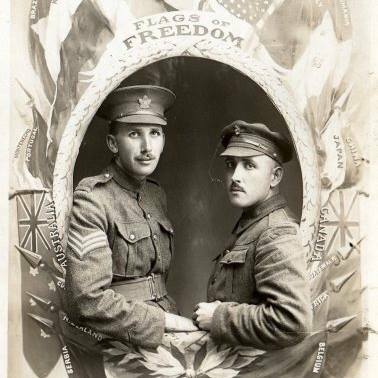 Anthony enlisted in the Canadian army at the beginning of the war in September of 1914. He was wounded in the left arm in June of 1917, and gassed in September of 1917. He also suffered from an infection in his leg in March of 1916. In June of 1918 Anthony was discharged due to shell shock and varicose veins, which were caused/aggravated by gas. He returned to the Peace country after the war and lived on his farm until he retired in 1944. Anthony died on November 12, 1957. Abner was born in Centreville, Nova Scotia on October 29, 1887 to Delancey R. Graham. He enlisted in the Canadian army in January of 1916. In April of 1917 Abner received a gunshot wound in his left shoulder, and in September of 1918 he received shrapnel wounds to his back and left him. He was awarded the military medal in 1918. After the war, Abner and his wife Lottie May settled in the Kleskun/Bad Heart area (26-73-3-W6). Abner died on January 11, 1958 and was buried in the Teepee Creek cemetery. Richard was born in Stouffville, Ontario on August 20, 1892. He came to Grande Prairie in 1911 and filed on a homestead at 21-73-8-W6. In December of 1915 Richard enlisted in the Canadian army. Toward the end of the war, in October of 1918, he received a gunshot wound to the left thigh. He visited Grande Prairie in March of 1919, intending to return to his homestead after receiving his discharge. According to his military service file, Richard was living in California in 1923. He died on March 28, 1956. Walter was born in Lakeside, Nova Scotia on April 12, 1900. He was working as a fisherman in Centerville, Nova Scotia when he enlisted in the Canadian Army in December of 1915. Because he was underage, Walter lied about his age on his attestation paper and stated that he had been born in 1897. After the war, Walter came to the South Peace and filed on SE 13-75-3-W6. During World War II, he served in the Veterans Guard of Canada. Walter died on November 14, 1953. Edward was born on February 2, 1896 in Grand Forks, North Dakota. His family moved to Montana when he was a small boy and after several moves eventually settled in Leader, Saskatchewan. Ed served in the American army from 1917 until 1919 and returned to Saskatchewan after the war. In 1926 he settled in the Sexsmith area, on a homestead purchased from the Kleskun ranch (S1/2 30-73-3-W6). Ed married Florence Wendt, whom he had met during their high school years, in Kalispell, Montana on January 24, 1928. They returned to Ed's homestead in the South Peace and continued farming until Ed retired in 1944. Ed also served on the local school board, the County Council, the Advisory Board of VLA after World War II, and as president of the Teepee Creek Stampede Association. Ed and Florence had five children. Ed died in Grande Prairie on April 16, 1960. Jack was born in London, Ontario on May 28, 1880. He came to Winnipeg with his family as a child, and in 1915 came west to Alberta. Jack worked on a ranch in southern Alberta before joining a railroad survey party which brought him to Grande Prairie. He joined the Princess Patricia's in October of that year. Jack was wounded at Ypres in May of 1916, and also suffered from lumbago and myalgia. While in England, Jack married Leah Swain. They settled in Vancouver after the war but the damp west coast climate had a negative effect on Jack's health and in 1923 the couple came to the Peace River country and filed on a homestead in Debolt (SW 1/4 9-72-1-W6). Jack died on November 6, 1957 and was buried in the Debolt cemetery. Benjamin was born in Wingham, Ontario on November 7, 1877. He was a furniture dealer when he enlisted in the Canadian army in 1915. At that time he was residing in Bassano, Alberta with his wife Matilda. He joined the Nova Scotia Machine Gun section and went overseas with the 82nd Battalion from Calgary and later was transferred to the 25th Nova Scotians. Benjamin was injured on April 9, 1917 at Vimy Ridge. He was shot on his right side shattering a part of his arm and breaking two ribs. He was transported to a hospital where he was treated; the wounds healed but the bones in his arm did not and he eventually was sent back to Canada. There they continued to work on his arm. He had an operation but the bones would not mend and in 1918 they amputated his arm. Benjamin settled in the Clarkson Valley and DeBolt district a few miles east of Crooked Creek and was known for the wonderfully constructed buildings on his farm. His homestead was located at S1/2 19-75-9-W6. Benjamin farmed and for a short time had a store on the farm. He opened the store on June 15, 1934. Benjamin died at the age of 58 on September 4, 1938. Harry was born in Belfast, Ireland, where he spent his youth and childhood. As a young man, he worked in a woolen mill. Harry served in the First World War and came to Canada after his discharge. He settled on an acreage near Valleyview in 1928 (S1/2 18-70-W5). Harry also served in the Second World War, as a bodyguard to the Duke and Duchess of Windsor in the Bahamas or Barbados. He died in Valleyview on February 14, 1956. William was born in St. George, New Brunswick on July 1, 1890. He came to Grande Prairie in 1912 and filed on the SW1/4 of 33-73-7-W6. William enlisted in the Canadian army in January of 1917, then returned to his homestead in the South Peace. As a veteran, he was able to file on an additional quarter (31-74-7-W6). Three years later, William married Ethel Turner. The couple had three daughters, but sadly Ethel died after the birth of their third daughter in July of 1929. Years later William remarried to Jean McClure, who died three years after their marriage. William served on the Bear Lake Municipal Council as well as the Divisional School Board. Professor Green, an Englishman, came to Grande Prairie as a missionary in 1912. He was not an ordained minister, unlike the other two men in his party (Hugh Speke and C.W. Trevelyan), but had worked as a professor in an English university. A month after the war started, all three men returned to England to join the British army. Professor Green was killed in action. Aylward was born in Lucknow, Ontario on August 1, 1889. He enlisted in the Canadian army in February of 1916. Aylward received shrapnel wounds to his right thigh in April of 1917. In early 1918 he went to Canada on furlough; in July he was declared to have been absent for over a month and labeled a deserter. However, Aylward was taken back on strength in August of 1918. He was married to Frances Germaine but the couple were divorced after the war. Following discharge in 1919, Aylward came to the Blueberry Mountain district and filed on NW 9-80-8-W6. On April 12, 1920, Aylward married Mary Meadowcraft in Moose Jaw, Saskatchewan. They came back to Blueberry Mountain to raise their family. Aylward served in the Veteran's Guard during the Second World War. After his discharge, he sold the farm and he and Mary moved to Bow City. Aylward died on April 11, 1973 in Calgary. When Ernest enlisted in December of 1916, he gave his date of birth as January 13, 1897. In truth he was born on January 13, 1900 in Graham, Iowa. He came to Canada with his family in 1906; the family took a homestead near Silverwood in 1916. Ernie's homesteads were located at 16-77-5-W6 and 8-77-5-W6. On March 8, 1922, Ernie married Oma Thompson. They lived on the farm until 1935, at which time they moved into Rycroft. Ernie worked for the Department of Agriculture for about thirty years and retired in 1970. He died on January 10, 1977. Napoleon was born on December 23, 1896 at St. Antonin, Quebec. He enlisted in the army on August 24, 1918 in New Brunswick and was discharged on March 15, 1919. On May 24, 1932 Napoleon married Rose Lavoie. The moved to Girouxville, Alberta in May of 1944 and settled on their homestead at NE 5-78-22-5. Napoleon died on September 29, 1980. Jarvis was born in Corbyville, Ontario on January 27, 1891. Before the war, he worked as a miner in Ontario. Jarvis was married to Florence Emma, an Englishwoman, during the war, sometime at the end of 1917. In August of 1918 at Arras, Jarvis received gunshot wounds to his right leg. His leg was amputated the following month and he was invalided to Canada in March of 1919. Jarvis and Florence came to the Hythe area in 1921; they went to Vancouver for a little while, but returned to homestead in Lymburn (21-73-11-W6; 34-73-12-W6) around 1925. When they left the homestead and moved to Lymburn, Florence opened a small restaurant on main street. Jarvis died on February 22, 1949. Edwin was born on June 14, 1880 in Bromley, Kent, England. He came to Canada in his youth and joined the Royal North West Mounted Police in 1903. In 1905 Edwin was posted to Grouard, where he served until his marriage in 1909. His homesteads were 19-72-6-W6 and 24-72-7-W6, in the Bear Lake area. Apart from his time in the army, Edwin lived there the rest of his life. 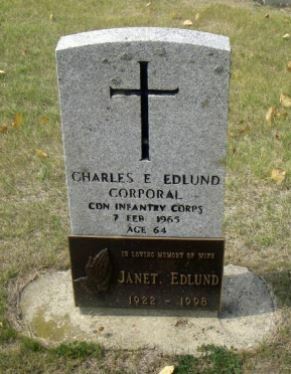 He died on March 1, 1957 and was buried in the Grande Prairie Cemetery. Lacy was born in Ackworth, Yorkshire, England on September 7, 1875. When he enlisted in June of 1915, he and his wife Emily were living in McLennan; Lacy had filed on homesteads at 20-77-19-W5, 34-77-19-W5, and 10-78-19-W5. In September of 1916, Lacy was wounded in his right leg, and in August 1917 at Lens he received a gunshot wound to his left arm. Lacy died on May 21, 1930. John was born Whitesand, Saskatchewan on August 21, 1883. In 1910, he came west and filed on the eastern half of 27-71-6-W6 in the Bear Creek district. John enlisted in the Canadian Army in December of 1914. According to his service file, he attended sniper's school in May of 1916. In June of 1916, John was believed to have been killed. What had actually happened was that he had been captured on June 2, and his prisoner of war status was not reported until July 11. John was held at Dulmen, Wahn, Sprottau, and finally at a chateau in Switzerland in December of 1917. He was in hospitals, possibly with tuberculosis, as a prisoner of war. John was finally repatriated in December of 1918. He died on August 12, 1947. John was born in Fort St. John, BC on January 27, 1894. He settled on LT29 in Spirit River in 1913. In July of 1915, John enlisted in the Canadian Army. In April of 1917, he received gunshot wounds through his right shoulder. He was wounded a second time in August of 1918, this time gunshot wounds to his right thigh. On September 6, 1918, while in the trenches at Vis-en-Artois, John was hit in the back by shrapnel and killed instantly. Frank was born on November 8, 1871 in Eccles, Lancashire, England. By 1911 he had immigrated to Canada and settled in the Peace River country. Frank enlisted in January 1915, but was discharged in May because he was "not likely to become an efficient soldier." Not to be dissuaded, Frank reenlisted in July of 1915 and this time was sent overseas to England. However, he was once again discharged in February of 1916; the reason stated was, "undesirable, character very bad. Frank suffered from chronic bronchitis, caused by years spent working in mines. Isaac was born in Eccles, Lancashire, England on August 29, 1876. He enlisted in Edmonton in August of 1915 and was in the trenches with Jim McDonnell and other Grande Prairie boys of the 46th Battalion in fall of 1916. As of 1922, military records indicate that Isaac was living in Fort St. John. He died on November 3, 1937.